The Interior Department announced Friday it is canceling future lease sales and will not extended current leases in Arctic waters off Alaska's northern coast, a decision that significantly reduces the chances for future Arctic offshore drilling. Interior Secretary Sally Jewell said the federal government is canceling federal petroleum lease sales in U.S. Arctic waters that were scheduled for 2016 and 2017. "In light of Shell's announcement, the amount of acreage already under lease and current market conditions, it does not make sense to prepare for lease sales in the Arctic in the next year and a half," she said. Jewell said the Chukchi Sea off Alaska's northwest coast and the Beaufort Sea off the state's north coast will not be included in the agency's next five-year lease sale plan. In addition, current leases held by Shell and other companies in Arctic waters will not be extended. Beaufort Sea leases are set to expire in 2017, and Chukchi Sea leases in 2020. Current market conditions and low industry interest made the leasing decision easier, Jewell said in a release. Royal Dutch Shell PLC is the only company actively exploring off Alaska's northern costs. It had applied to extend leases in both the Chukchi and the Beaufort. Statoil requested an extension for Chukchi leases. "When it comes to frontier exploration in Alaska, one size does not fit all," Smith said by email. "We continue to believe the 10-year primary lease term needs to be extended." In denying the extension, the Bureau of Safety and Environmental Enforcement's regional supervisor for field operations, Kevin Pendergast, said Shell had not met the criteria to extend its leases, including providing the agency with a work schedule on them. Shell could apply again, he said. Republican Gov. Bill Walker met with Jewell in Washington, D.C., earlier this month about extending Shell's leases and opening up a small part of the Arctic National Wildlife Refuge to drilling. His goal is to get more oil in the trans-Alaska pipeline, which is running at about a quarter of its capacity. Walker said Jewell's decision left him with a "loss of hope, in some respects" about accomplishing that. "That pretty much shut down offshore. The only thing left is onshore," he said of the agency's announcement. "We know where the oil is. We just don't have access to it." Environmental groups strongly oppose Arctic drilling. They say industrial activity will harm marine mammals already hurt by a loss of sea ice, and global warming would be accelerated by burning oil found in the Arctic Ocean. Miyoko Sakashita of the Center for Biological Diversity lauded the Interior Department's announcement. "This is great for the Arctic and its polar bears," Sakashita said. 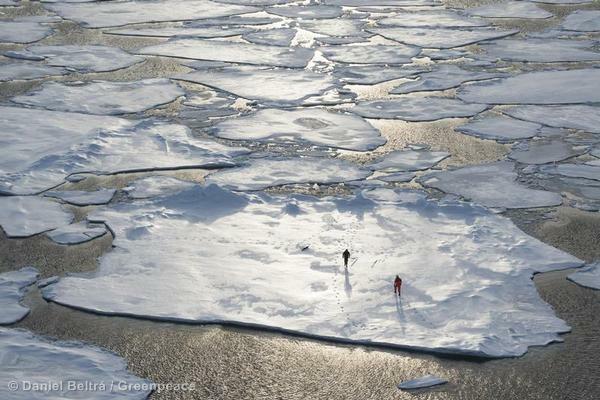 "We need to keep all the Arctic oil in the ground." Mike LeVine of oceans advocate Oceana added: "Secretary Jewell's decisions today are consistent with the law as well as economic and environmental realities." Sen. Dan Sullivan, R-Alaska, said the Obama administration is correct in wanting to help Alaska Natives and all Alaskans battle the state's high rates of suicide, domestic violence and addiction. But he said the administration doesn't see the link between economic opportunity and making people's lives better. "They just took real opportunity, significant opportunities that could benefit thousands if not tens of thousands of Alaskans off the table," Sullivan said. "That's not going to help the social problems. That's actually going to make them worse." Rep. Don Young, the longest-serving Republican in the U.S. House, said this battle will likely end up in court. "I think this administration is adamantly opposed against fossil fuels, period," said Young, Alaska's sole House member. "They'll do anything to stop it. I don't think they have a legal leg to stand on."